Have you ever wondered why it is that some homes can look dated only a few years after they have been built, while others look current and almost trendy despite being decades old? Custom home builders in NC will tell you it’s because these homes have what is often referred to as a timeless design. This type of design is one that will not only stand the test of time but is always going to look like it’s new and trendy. If you want custom home builders in NC to create a timeless design for your home, the best place to start is by looking at the classics. In other words, seek out those homes that already seem to have that timeless look. Look at the different colors, designs, and styles considered to be “classic” and build your design around these concepts. Classic styling is just what its name says, styles that draw on history to create a new look that will endure. The Greeks used columns, busts, stripes, statues, and an amazing array of architectural molding in their homes. You can draw upon these for inspiration and make use of natural materials such as wood, cotton, brick, stone both inside and out. A good timeless home design is one that doesn’t get its ideas from the latest trends. The design should instead be a little understated, sophisticated yet simple. Your home design should be one that considers function before form yet is not boring. Any design you choose should be one that can be adapted as life changes or the house is sold. If there is one thing you can’t help but notice when it comes to timeless homes, it is that they tend to be rather sensible and functional in design. Create rooms that will have neither too much nor too little space for your furniture. Choose fixtures that while quite beautiful and functional are not over the top. Choose furniture that will best compliment the size and style of your rooms. If you look at traditional home décor, one of the first things you notice is a high usage of neutral colors. Colors like off-whites, beiges, grays all play a large role in timeless designs. They are often offset by bright white fixtures and moldings that bring the rooms together. Avoid trendy colors if you can or at least try not to make them the main focus of the room. Working with your custom home builders in NC, create a design that is not overstated yet is large enough for your needs now and in the future. Use plenty of neutral colors both inside and out to create a warm traditional look and you are well on your way to owning a timeless home. 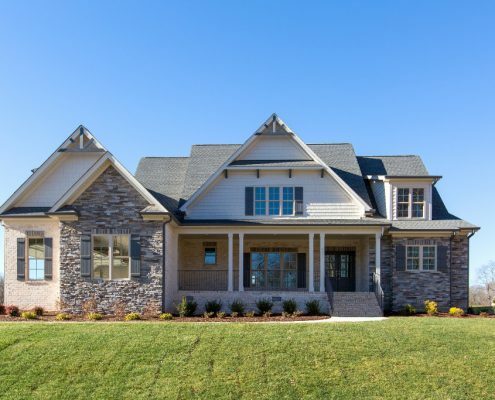 For more information and help designing your next home, please contact R&K Custom Homes at (336) 643-3503 and talk to our team of expert custom home builders.